Easter is really early this year, but there’s still so much to do and see at the Gardens over the whole of the holidays. · You can also book in for a 1-2-1 ‘M-Check’ session with the team. They will check over your bike with you, do simple repairs and advise you. 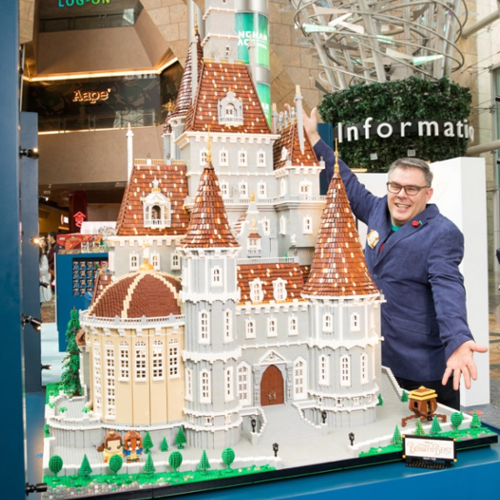 Calling all LEGO® enthusiasts young and old, come and meet Kevin Hall of Brick Galleria, a professional LEGO® model builder who is bringing 40,000, yes 40,000 bricks with him. We're thrilled to welcome Brick Galleria to our Gardens this Easter. They have worked with some of the very best LEGO® events in this country and internationally. Book on to one of the 45-minute sessions available throughout the day, to get your hands-on with the experts. Be part of our making our fabulous ‘Menagerie of Creatures in a Day'. Will your little animal model win the prize at the end of the show day? After the Brick Day fun, you are free to explore the gardens, maze and cafe! We are open as usual for family egg spotting….. Dotted around the Gardens are clues where the Easter Bunny has hidden eggs. Come at any time for a gentle spring quest for eggs. There’s a Giant egg too, that needs your help to decorate it. Free chocolate egg for each child who completes the hunt. £2 for everyone over 5 years of age, free for Family Activity Annual Pass holders. The first battle of English Civil War was fought just 4 miles away from the Gardens. This weekend we welcome Colonel John Pickering’s Regiment of Foote for the weekend. · Displays, drills and demonstrations throughout the weekend as this 17th century re-enactment group make camp in the grounds. · Wander among the Parliamentary troops and their followers as they prepare for battle at Curdworth Bridge, near Water Orton. Normal Entry Prices: £4.50/£ 4 (plus Gift Aid), children £1, under 5s free. Natural Art Practitioner's Course with renowned Environmental Artist Richard Shilling. Land art and environmental art is growing in popularity – Richard Shilling is one of the leading proponents. This is his first workshop in the region. Come and enjoy and take heart. Richard's courses sell out fast and we are lucky to get him this far south. The day workshop is ideal for Forest School Leaders, Teachers, Artists, Students or anyone wishing to learn about environmental art techniques and methods or someone looking for time out from the rat race. No self-perceived artistic talent is required, the techniques you will be shown are simple and accessible and yet will result in fascinating creations of which you will be proud. We will explore the creative process and how the art is developed by deepening your relationship with nature, through the practice of ephemeral art we seek to discover the subtle nuances in nature and be drawn into the environment and start to understand the cycles and processes of flux and transience. You will be guided through this process so you can discover for yourself its ethos via its practice and then take away with you a deeper understanding of how to continue your journey and make further progress through this art form. Investigate different creation methods and techniques using natural materials and limited tools. £45 per ticket. Limited to 20 participants, BOOKING ESSENTIAL. Accompanied children are allowed. Parents or guardians are responsible for their welfare at all times. Be aware the workshops are designed for adults and the day is not really suitable for very young children. Suggested minimum age 8 years old.